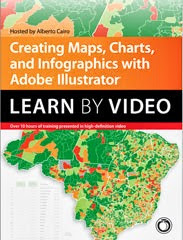 Yesterday a student of mine asked how to make an infographic like the one on the right in Adobe Illustrator (source). Click on the image to expand it. The author is Kir Khachaturov, who has a very nice design portfolio. I immediately tweeted that I would indeed show her some software tricks, but that I'd also explain why this may not be a good idea. See, timelines (or bar charts, urgh...) shaped as circles are usually very hard to interpret, and not only because they force you to tilt your head to read the labels. It's true that they look pretty, and this one isn't an exception. It is very pretty. However, once you start trying to extract meaning from it, it becomes a bit frustrating. 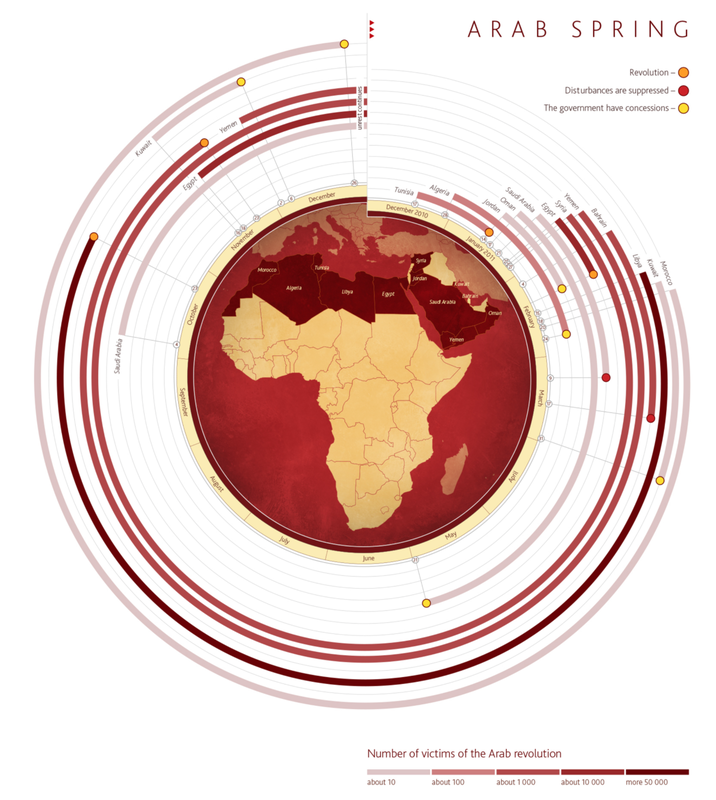 @albertocairo The circle is meant to show a yearly cycle, right? 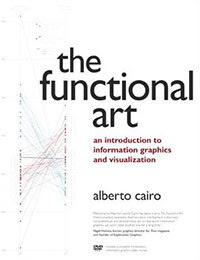 @albertocairo ie. at the point where last year and this one meet, you can compare states from one year to the next. 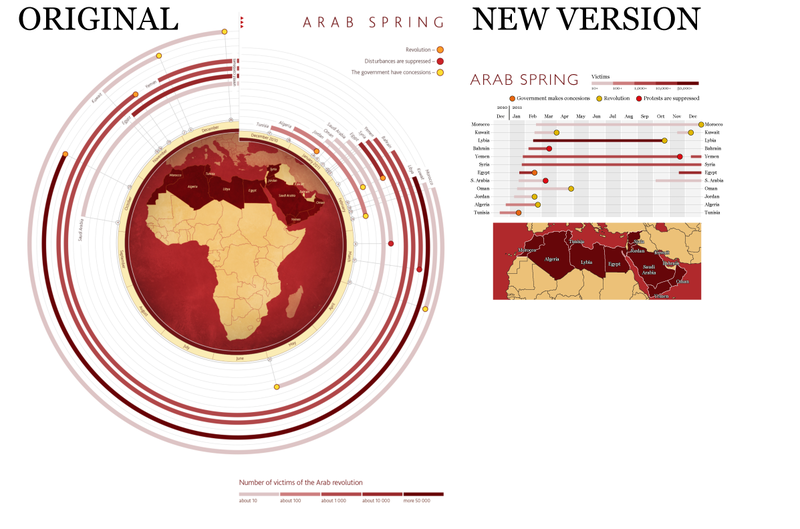 @albertocairo Also, radial plotting allows for a lot more timeline length to be shown, which is important in areas of density like January. 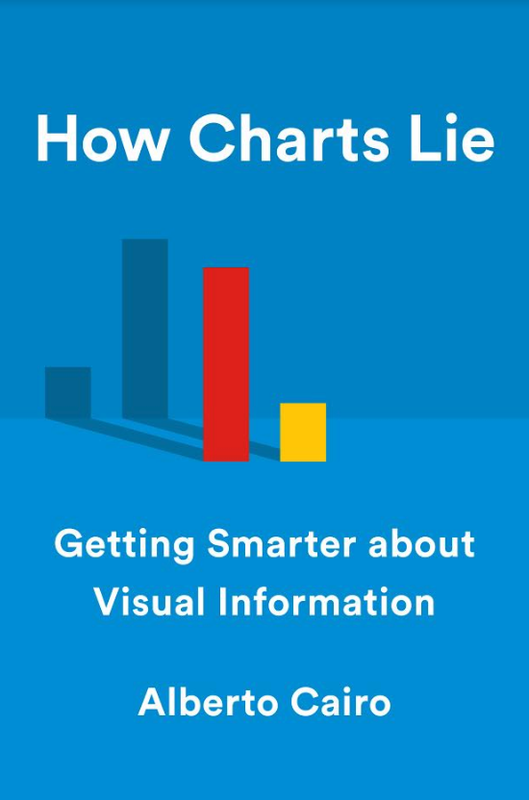 I'm a fan of Jer's work —he's going to be one of the interviewees in my 2016 book— and, as I'm not in favor of strict rules in visualization,* I first conceded the circle might indeed let you cram more information into a smaller space. As for the idea that the original lets you clearly compare Dec. 2010 to Dec. 2011, I wasn't sure at all, and I said so in our conversation. Anyway, I'm traveling alone today. I woke up really early and got bored during my long breakfast, so I decided to test my thoughts —and Jer's. In visualization you usually won't know if a particular shape works until you actually use it and compare it to as many alternatives as possible. I redesigned the timeline, using similar colors and font sizes as the original. Version 2 is much easier to read. I also put the new version next to the first one, to show that the circle turns out to be less space-efficient. 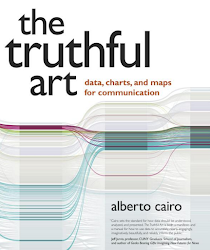 As a reminder, I believe that there's a difference, no matter how fuzzy it is, between information visualization (graphics to amplify cognition) and data decoration and data art which are both fine areas. *I do believe that many flexible rules do exist, and need to be respected, though.